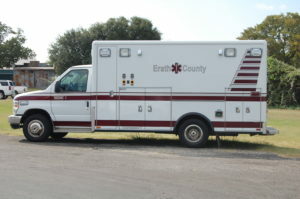 First responders of Erath County traveled down to the coast to donate goods such as food, diapers , socks and all kinds of non-perishable items to those affected by Hurricane Harvey. Hurricane Harvey, the first major and disastrous hurricane to make landfall in over ten years, hit the Gulf of Mexico on August 25, 2017. The eye of the storm, which is the part of the storm that has the strongest power, hit a small town called Rockport, Texas. The town is oceanside and has damage that will take years to replace. Hurricane Harvey also devastated Houston, Corpus Christi and the surrounding towns. Erath County EMS traveled to the Houston area to donate goods for those affected by Hurricane Harvey. Photo by Rebecca Hernandez. The wind and rainfall that came along with the Hurricane took apart houses, killed people and had record breaking flooding all across Texas’ Gulf of Mexico. Regarding whether Erath County first responders would be able to take a trip back down to the areas affected by Hurricane Harvey, Drake said this past trip was all they were able to do.